The URUCUM, also called Anatto or Roucou, is a small and native tree from the Amazon. The common name URUCUM comes from the indigenous Tupi word “uru-ku”, which means “red”. It is traditionally used by brazilian indians, who grind the seeds into a powder used to make red body paint and to protect the skin against strong sunlight and insect bites. Our URUCUM OIL EXTRACT is produced throught maceration of the urucum seeds in Oleic Sunflower oil. 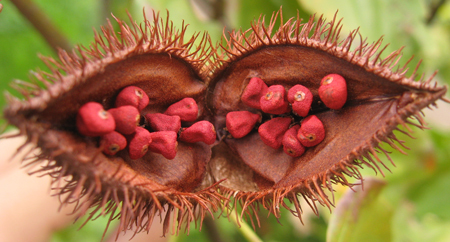 This process allows to obtain an oily extract containing the lipophylic actives contained in Urucum Seeds.The oily extract is reddish in color due to the high content of natural carotenoid (natural pigments). The main pigment are bixin (80%) and norbixin, which are classified as carotenoids and which concentration is six times higher in urucum than in carrot oil. URUCUM OIL EXTRACT is a good emollient whith natural red color. Its high content in carotenoids makes it a natural suntan product, it helps to tan and to maintain the tan. It is indicated for an array of cosmetic products as it is easily incorporated into creams, lotions, sunscreen, lip balms. Storage: Store in cool conditions (below 25°C) away from light and humidity in unopened containers. Shelf Life: 18 months in original unopened packaging.